Tribes in the Rif mountains of Morocco often roast whole stalks of freshly harvested marijuana outdoors over a fire, turning them frequently and taking care not to burn the leaves and flowertops. These are then sprinkled with salt, dipped in honey, and eaten off the stalk. The following is a more sophisticated recipe based upon the practice of these tribes. Select a number of small- to medium-size buds (2-to 4-inch lengths). Choose a grass that is tasty, easy to chew and which leaves no acrid aftertaste. Slightly immature buds with few or unripened seeds make matters easier. If the grass is fairly fresh and not dried out and crumbly, the seeds can be removed by lightly rolling the bud between the thumb and forefinger. Most of the seeds will fall right out of the bud. Seeds that are more difficult to remove can be loosened and popped out with the thumbnail. When the seeds are out, take a piece of string and tic a loop around the stem of each bud. Loops should be at least two inches apart to insure that the buds not stick together. In a small saucepan over low heat, melt a few tablespoons of ghee (or cannabutter if you want extra strength). Tilt the saucepan so that the butter collects in one corner. Briefly dip each bud into the molten butter. Keep it submerged no more than a second or two- Vou want to soak the bud with butter, but not extract any of the resins into the butter. Swish the bud around while submerged so that the butter gets to the in-between places. Suspend the string for 15 minutes to allow excess butler to drip from the buds. Dip each bud in honey. Move the bud up and down in the honey to coat it thoroughly. Again suspend the string of buds and allow honey to drip. Keep this in a place where it will not attract flies or ants. After a week, the honey will have hardened somewhat. It may then be dipped a second time. After another week of drying, the honey will again be somewhat hardened. The buds may then be eaten or allowed to hang longer. 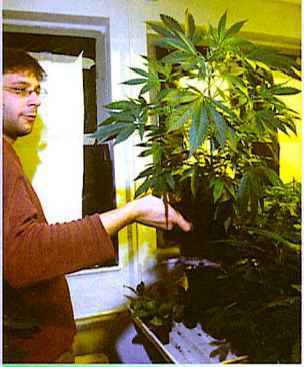 This is an excellent way of preserving the potency of the buds. The coating of honey protects the THC from oxidation. If the grass was fairly fresh or if it came from a northern environment, it may have much of its THC present in the form of THC acid. If this is so, the bud may increase in potency while ii is stored because much of the THC acid will convert to active THC. If faster conversion is desired, the buds may be placed in an oven for one hour at no higher than 225°F immediately before the second honey dipping. If buds are to be kept for a long time, they should be allowed to harden for several weeks after the last honey dip and then be wrapped in foil or plastic wrap. Candy buds are a tasty and stony confection which preserves the original fragrance of the grass. Different grasses will have different flavors. Thai sticks, sin-semilla, Panama red, Kona gold, and light green Michoacan are good choices. Experiment, have fun, and chew your candy buds well for best results.